Water is the fundamental ingredient for life on Earth. Looking at our Earth from space, with its vast and deep ocean, it appears as though there is an abundance of water for our use. However, only a small portion of Earth’s water is accessible for our needs. How much fresh water exists and where it is stored affects us all. 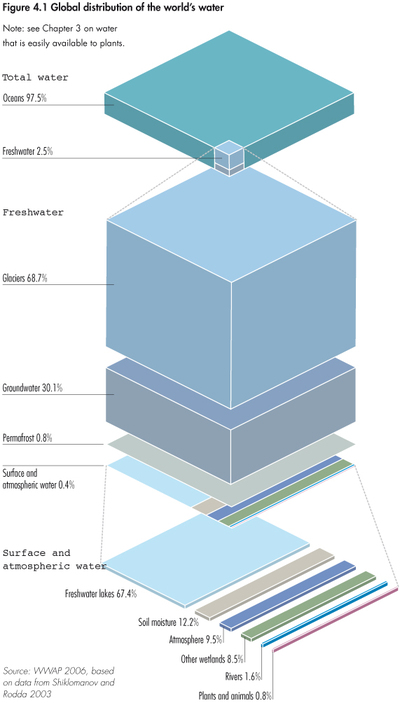 Around 97 % of the Earth’s water resources are salt water. A significant proportion of fresh water reserves are trapped in the polar ice caps and glaciers and only 0.649% of all water resources can be used for drinking. According to UNO estimates, the world’s population is set to increase from approximately 7.2 billion today to 9.6 billion by 2050. Due to the increasing average per capita consumption of water, currently 625m³ per annum, water consumption will also grow disproportionately. Globally, more than one billion people have no access to clean drinking water. In 25 years up to 6 billion people will be experiencing water shortages because of poor hygiene. Even Europe’s natural water resources are being put under ever-increasing stress. Water stress arises when the amount of water used exceeds availability. In Austria, only 3% of the total renewable water supply is extracted annually – we therefore live in a veritable water paradise. By contrast, Bulgaria and Belgium, for example, suffer from water stress because they consume 55% and 41% respectively per annum of the renewable water supply.